What is an Ankle Foot Orthotic (AFO)? An AFO is a device that supports the ankle and foot area of the body and extends from below the knee down to and including the foot. This device is used to control instabilities in the lower limb by maintaining proper alignment and controlling motion. AFOs can be dispensed over the counter or custom made from a 3D cast of your foot/ankle. Sound Orthotics only dispenses over the counter AFO which can be “customized” with a custom foot orthotic or modified to meet your specific needs. A static orthosis is flexible or rigid L shaped AFO with the upright portion behind the calf and the lower portion running under the foot. 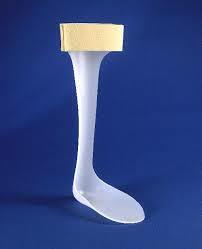 The static AFO is used to support the weakened or paralyzed body parts in a particular position (e.g. drop foot from a stroke). A flexible AFO can provide some dorsiflexion assistance (e.g. weak shin muscles) to the ankle joint but does not provide much stability to the subtalar joint. A rigid AFO can block ankle movements and stabilize the subtalar joint. The rigid static AFO can be designed to help control adduction and abduction of the forefoot. A dynamic orthosis (articulated) is used to facilitate body motion to allow optimal function. A dynamic AFO provides subtalar stabilization while allowing free ankle dorsiflexion and free or restricted plantar flexion. This type of AFO is used to treat adult acquired flat foot.Depending upon the type of hinge used the dynamic AFO may provide dorsiflexion assistance to correct foot drop. Start Your Journey Toward Pain-Free Living Today! Get in touch with us at 705-342-7728 or at info@soundorthotics.com or come visit us at our 8 Murray Point Road location and set up your footcare consultation appointment.